For the Vintage Village Christmas Special Fair we were lucky enough to rope in a guest curator of the 'Finds' - fashion stylist Elizabeth Moss. Not only has Elizabeth worked with stellar clients such as Dazed and Confused magazine, Topshop, pop star Kate Nash and Co-operative Designs, she is also a lecturer in fashion at the University of Salford. 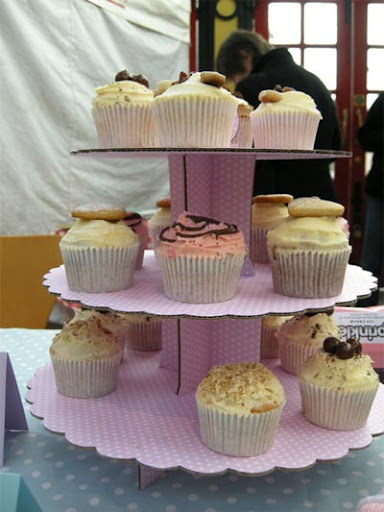 We let Elizabeth run riot all over the fair with her camera, and here's the results! 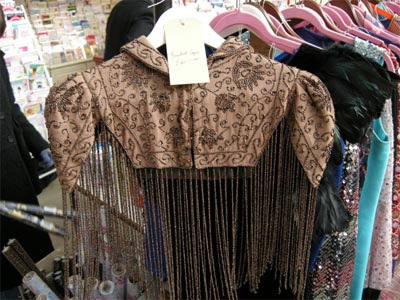 Edwardian beaded cape, £40, from Belle Dame. 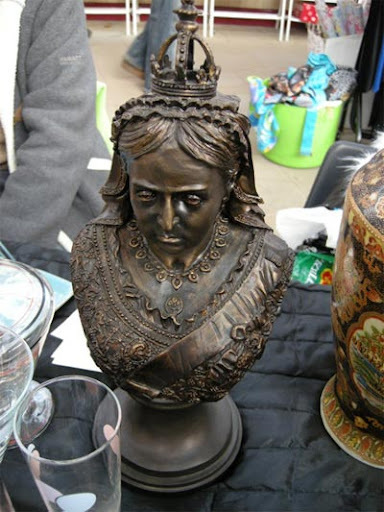 A stern bust of Queen Victoria from Gillian Kay, £10. 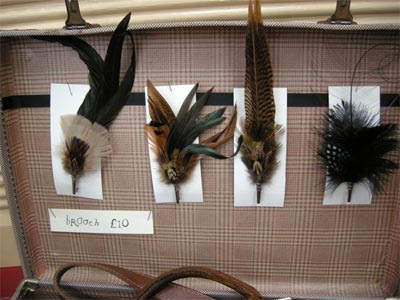 Hand made feather brooches from Lady, Behave!, £10 each. 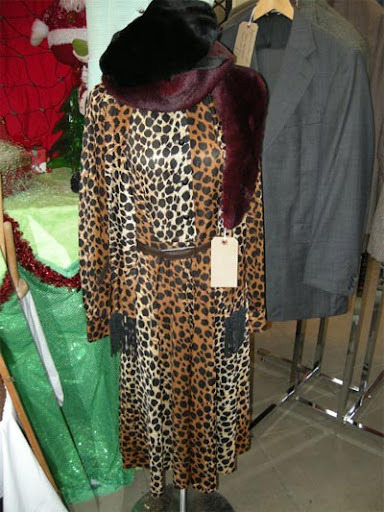 Leopard print dress with matching scarf, £55 from Village Vintage Clothing. 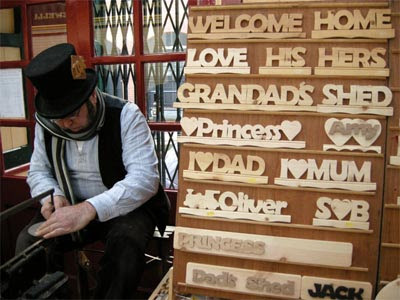 Brian Taylor, using an antique treadle fret saw to cut wooden names to order. Cupcakes from Sprinkles Ice Cream. 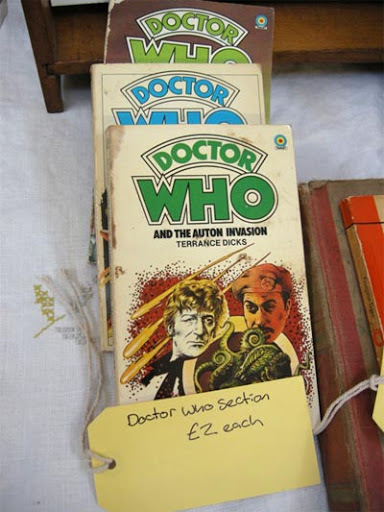 1970s Doctor Who paperbacks from Bags of Vintage, £2 each. 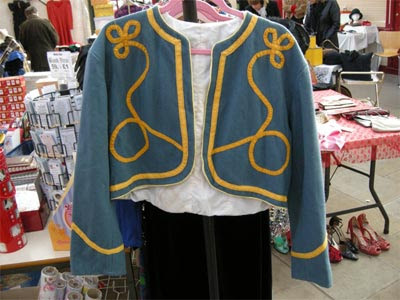 Military-style jacket from Belle Dame, £10. 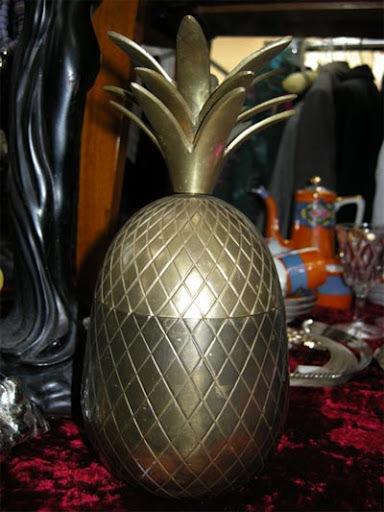 Vintage Surprises, brass pineapple £10. 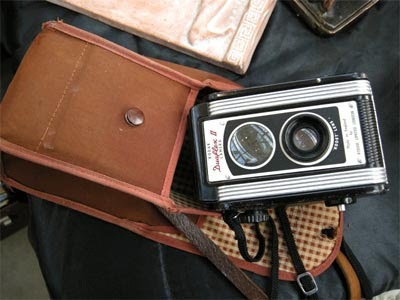 Vintage Kodak camera from Gillian Kay, £5. 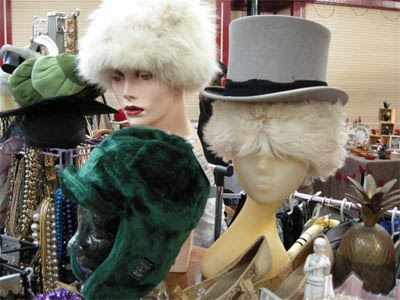 Assorted hats from Vintage Surprises. 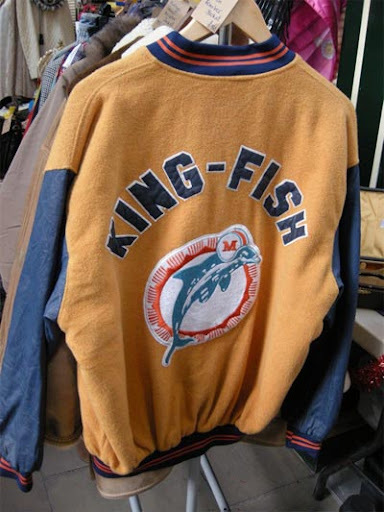 Miami Dolphins jacket from CC Vintage, £30. 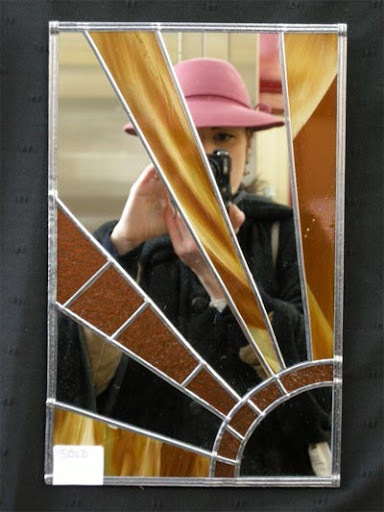 Angela Lowis's hand crafted mirrors, between £20-£30. 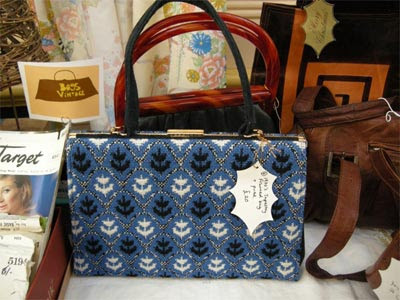 1960s-70s Welsh tapestry handbag from Bags of Vintage, £20. 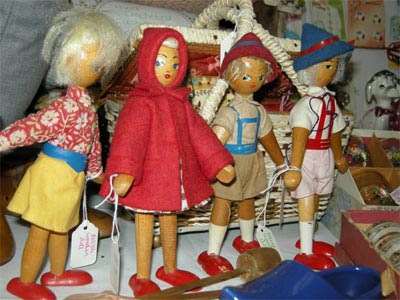 Polish wooden peg dolls from Agnes Darling, £8 each. 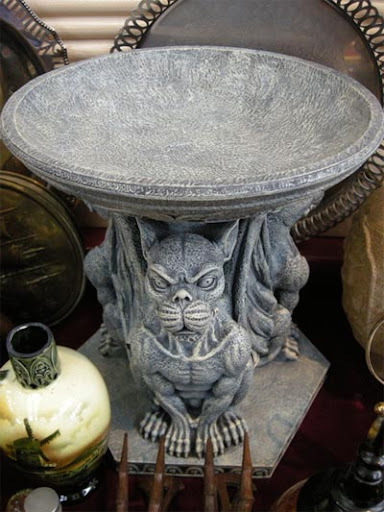 An early 1970s bird bath (? possibly!) from Acorn Curiosities. 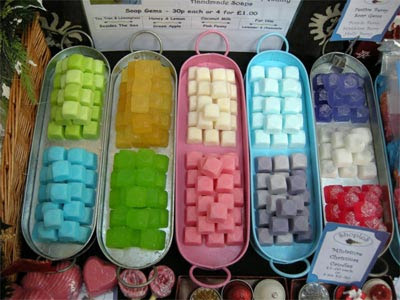 Shoples pick'n'mix hand made soaps, 30p each. 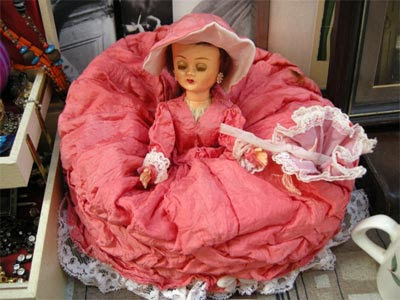 1940s doll nightie case or boudoir doll, from So Vintage, £5. 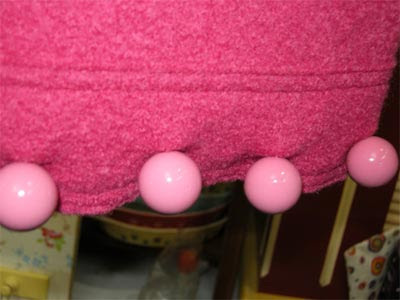 Moschino Jeans skirt with bobbles on the hem, £20 from Anne Langton. 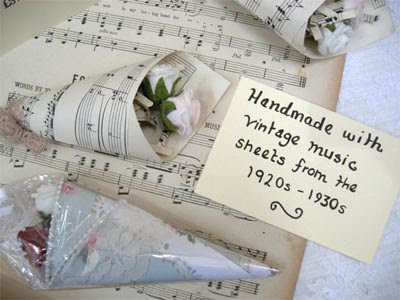 Music sheet rose cones, £3, from Vintage Twee. 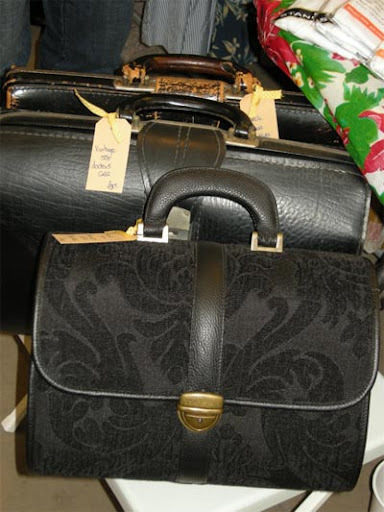 CC Vintage had some very smart black bags, £30-£45. 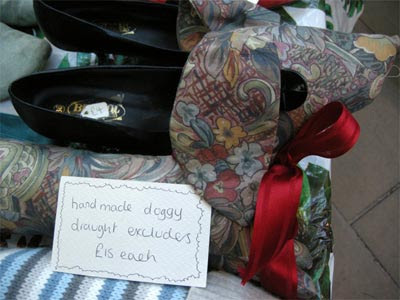 Hand made doggy draught excluders, £15 from Fikle. 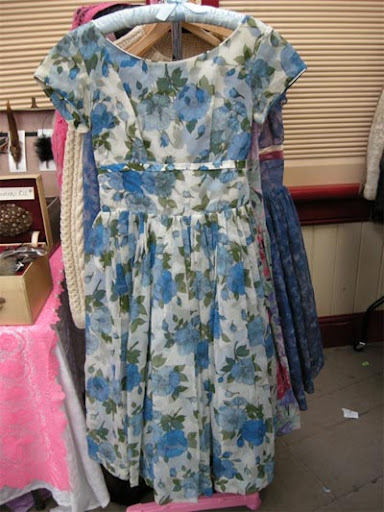 1950s floral frock from Lady, Behave!, £80. 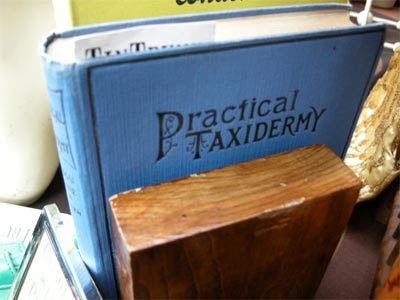 Practical Taxidermy, published in 1927, £35 from TinTrunk. 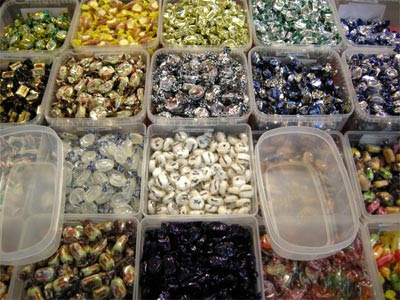 Elizabeth was very taken with the selection of sweeties at the Candy Shack, one of the permanent residents in the Market Hall. 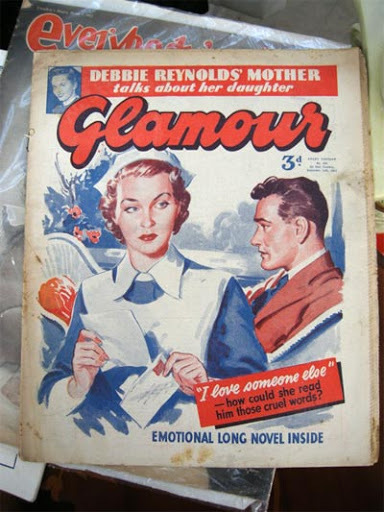 Glamour magazine, £3, from Gillian Kay.